Creating high-quality live video is not easy. 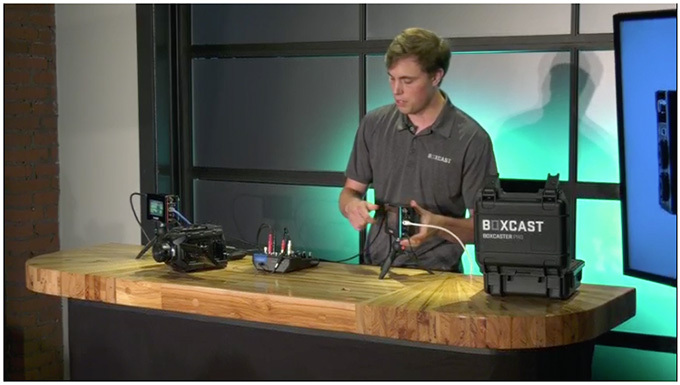 Boxcast illustrated many of these challenges in their live-streamed announcement earlier today of the new Boxcaster Pro. 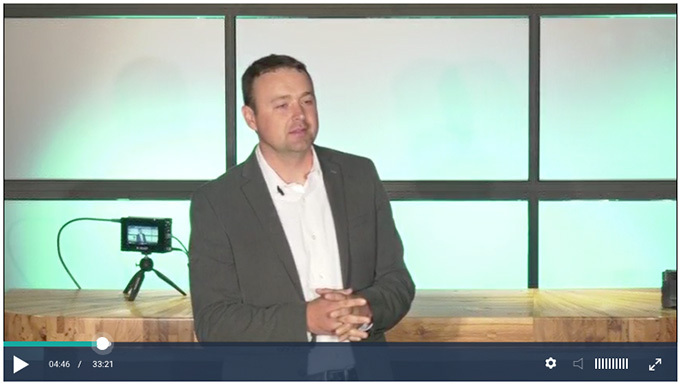 As I was watching this I realized that if a presentation is targeted at media professionals, the quality of the presentation needs to match those same professional standards. The Boxcaster Pro product is exciting. But, engineers should not design live television. Boxcast is a respected company, founded in 2013, that makes good products. 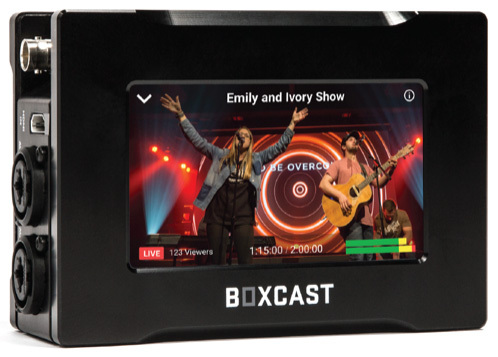 Their new BoxCaster Pro looks to be a solid all-in-one device that handles all the work necessary to take images from a camera or video switcher and audio mixing console, encode it into a high-quality, highly-compressed stream (using HEVC) and send it from your location up to the web for the world to watch live. With an introductory prices of $1,999 (US), the BoxCaster Pro can ingest video of any resolution from SD to 4K/60 and can stream up to 1080p/60. HEVC encoding allows users to stream events live without requiring large amounts of network bandwidth. The BoxCaster Pro has professional inputs and outputs, including HDMI, 12G SDI and balanced audio from 2 XLR and 1/4″ inputs. Its 4.3″ LCD touchscreen allows broadcasters to easily see a live video preview, along with video inputs, audio levels, and network information. Boxcaster Pro, as a product, seems impressive. But the production they created to announce it was a poster child of what not to do to launch a product. Let’s walk through what broke. Three people spoke during the event. The VP of Marketing, the CEO and the Product Manager. I’d tell you their names, but I have no idea who these people are; there were no titles and the introductions were mumbled. 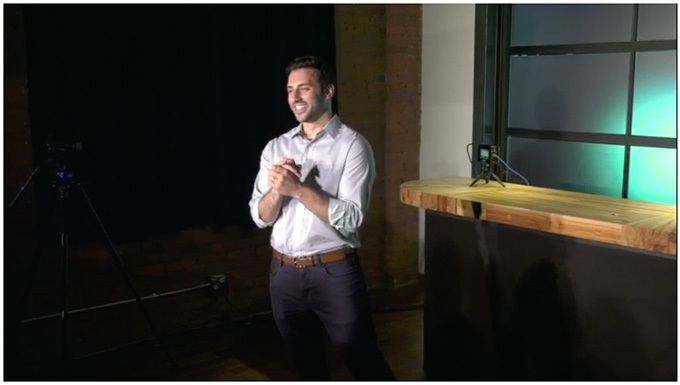 The live stream opened with a video of Cleveland, with lots of shots of a specific building. What was the building? No clue. What’s the relationship between LeBron James and Boxcast? No clue. Why was this the best possible opening to this presentation? Did no one think of writing a script – at least for the open? At the open, there were wild cheers from the audience, which we never saw, except for the backs of three heads from the center camera in the back. Why have a live audience if we don’t see them, or explain where we are, or even whether these are Boxcast employees? NOTE: Did the director use the audience for reaction shots to emphasize key product points? No. No titles, no graphics, no locators, in fact, the VP’s entire presentation rambled, a lot. 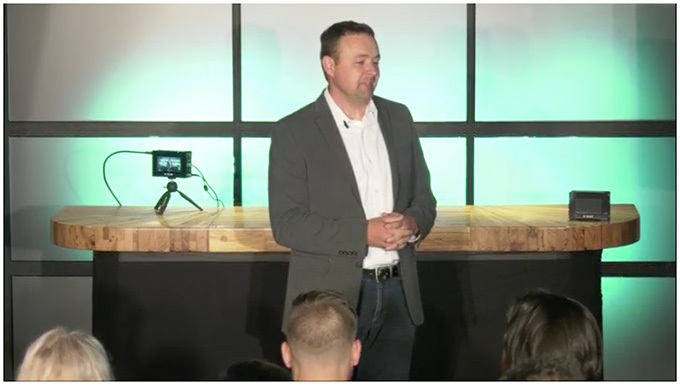 Apparently, the main reason the VP of Marketing was there was to introduce the CEO. Whom I don’t know and still can’t tell you his name. At least, I assume he was the CEO. Again, no titles, no graphics. Remember, this was a major presentation, hyped to the world. It would be nice to know who these people are. This trend of having people who were not identified continued through the entire presentation, which lasted for 35 minutes. I don’t know what they were using for prompter, but it was not through-the-lens and every presenter kept looking off-camera right at something, though we the audience never saw what it was, until the director, by mistake, included part of a monitor in the shot – they were using Keynote/PowerPoint slides for their notes. Really, people, prompters are not that expensive to rent. Why not share these slides with the viewing public? Why not integrate the monitor into the set? Why not use a through-the-lens prompter or, at the least, a prompter in a direct line with the center camera to maintain better eye contact? Why was it so important to make all the on-camera talent look awkward? Why so many side shots where we are looking at a black wall and the side of the speaker’s head? All three speakers were wearing lav mics, but the audio sounded like it was being picked up from a boom mic in the back of the room. Levels were soft, somewhat echoey, and thin. Sigh…. one of these days, producers will realize that audio is at least as important as picture and budget for it. Not this time, though. The set was about a 10×10 space, scrunched into a corner and all lighting seemed to be at eye level directly in front of the talent, while the backlight was positioned almost overhead. Presenters did not appear to wear makeup and appeared blinded by the lights; hot spots were everywhere and multiple shadows fell on the set. Lighting was uneven on the talent, the set and the product. The background was a grid of panels lit light green. If there is a worse color for caucasian skin, I haven’t found it. Worse, the demo table was about 3 feet in front of the set so that the presenter cast shadows on the back wall of the set. Of all the nice buildings and locations in Cleveland, why did they pick this corner of a closet? The main center camera, which provided central coverage, was out of focus and over-exposed. I can understand this being a problem at the beginning if the talent didn’t hit their marks, but it was never corrected during the show. 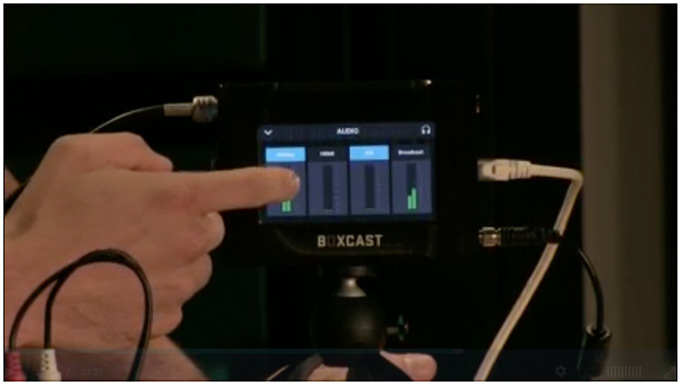 Boxcast made a big point of the new Boxcaster Pro allowing you to monitor your image using the 4″ monitor on the back of the device. BUT, that assumes someone is actually LOOKING at it. There were three cameras in the production: left, center and right. The director would insist on cutting to the right-side camera in the middle of sentences, even though the presenters were never looking at it. Worse, when they went to the product demo itself, it seemed to catch the director by surprise, because they did not have a closeup camera ready to showcase the new product when the demo called for a close up. And, when the closeup occurred, it was out of focus. By the way, from the applause, we know they had a live audience. But we never saw them. Not once, even at the beginning. They could have opened up this set tremendously by getting rid of the audience and move the presenters out of the corner and into the room. 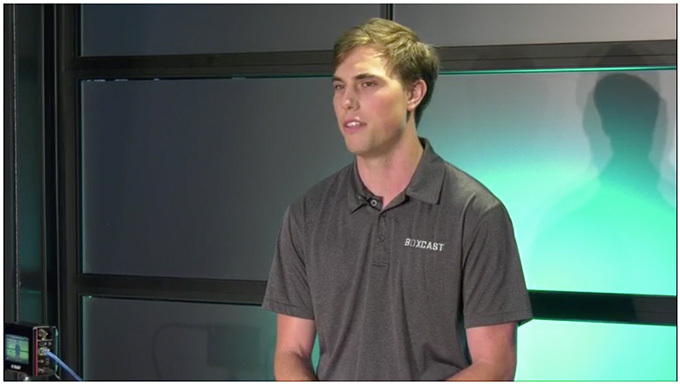 Here’s Boxcast, launching a major new product in today’s media world. Without on-set graphics, without illustrations, and without titles – in a set crammed into a corner of a tiny space in Cleveland. Even professional actors would have a hard time pulling this off. Why am I making such a big deal of this? Because I’m tired of companies that make hardware saying: “Look how easy it is to create professional-quality productions with our gear!” And then fail to create a professional presentation to support the announcement. Live video isn’t easy. 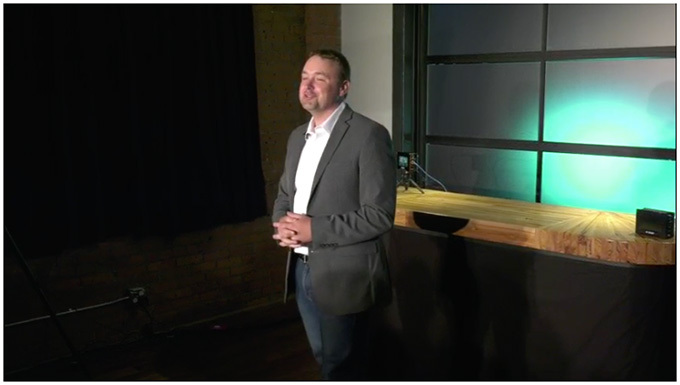 And this Boxcast launch was a text-book case of how to screw it up. Engineering a high-quality product is hard work and requires the skills and talents of many individuals. High-quality live television, equally, requires skills and talents that are totally different from an engineering mind-set. The problem Boxcast ran into is the same problem a lot of new producers run into. They are so excited about the concept of “doing it live,” that they don’t think through how the finished production will look. Live television isn’t easy. It is technically challenging with no room for mistakes. This live production could have been done better by most high schools in America. Which is a shame, because Boxcast’s products deserve better than this. NOTE: Here’s a link to the live cast, if you want to watch it for yourself. …and 33 minutes of it!! I guess you missed the very busy “Live from BOXCAST HQ in Cleveland, Ohio” graphic which included, at the end, a shot of that building. Trying to be so modern and jumpy and speed-ramping, no wonder you missed it! I couldn’t watch the whole thing, but: 30 minutes on the box? What about the switcher? where and how does that fit in? Thanks for doing a neg review for once! 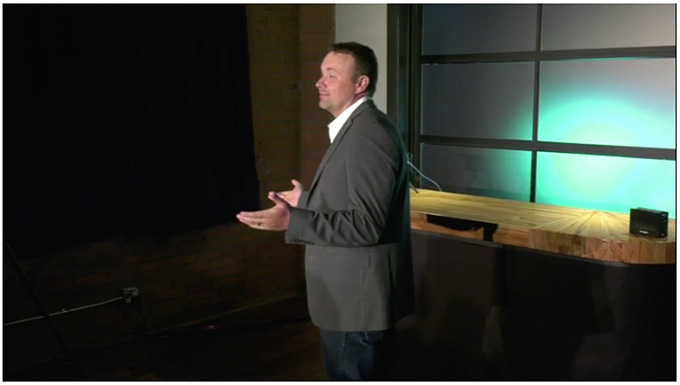 Larry, you gave a very insightful ‘autopsy’ on the poor quality of the Boxcast launch. I wish more people would be aware of how poor and thoughtless production value can wreck a product. On a similar level, I am so tired of seeing local TV commercials (especially law firms) looking like grade school productions. It should be a simple thing for businesses and small ad agencies to realize that poor lighting, weak talent, bland concepts, etc reflect directly on whatever it is they are trying to sell. I’m not buying anything from anyone with a sloppy presentation. Unfortunately, we are in an age most anyone can afford the tabletop gear without the skill and experience to use it well. Thanks. Thank you for sharing this, Larry. As someone who’s been working professionally in film and video for 55 years, I find it very sad to see effective communication skills down-graded as happened in their presentation. 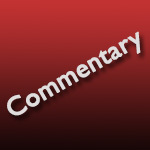 Hi Larry: I use Boxcast as my CDN and it easy to live stream to several platforms live at the same time. Everyone there is very friendly and helpful. But you are completely correct about their presentation. I am an experienced media professional, but a newbie live streaming. My first question about their new product is, if I have vmix or other streaming software, why do I need this box? What is it going to do for me? Still not sure. Thanks Larry for turning this into a great learning tool. Sometimes you can really learn a lot from looking at bad work. I critique my own work this way. I light a set or create a graphic and step back, take a look and say “It couldn’t look worse if I tried” then make it better. Your a teacher at heart. I shared this article and while writing the preface, I realized that after 38 years of editing, that for videos like this, editors are no longer editors, but morticians. OMG! I’m barely a amateur at all this. I watched this on YouTube (yes, they added insult to injury by uploading to YouTube, instead of just starting from scratch and doing it over). Every criticism you pointed out was warranted. No need to repeat. And all of the people on camera had no performance skills. They should at least had the thing run no more than 8-10 minutes, if that. But, there was an entertaining part of it. John, the last guy up, looked over to his left about every 10 seconds to read the next point. I couldn’t stop laughing! It’s not easy and too many people (like the BoxCast folks) don’t realize it. I watched about 5 minutes and then bailed out! It was too painful! Something I experience too often in presentations like these, is audio captured off a camera-mounted shotgun, in a reverberant space. The shot may be lovingly composed and even well-lit… and then the audio ruins it. I see it over and over on things like Kickstarter and other fund-raising videos that are trying to promote the appearance of high competence. I generally don’t finish watching the bad video, because if they can’t be bothered to do THIS right, it says a lot about how they operate, so I’m not going to take a risk on them. Presenter-wise, the director probably had no choice but to work with the “suits”, even though they have zero presentation skills. The client believes that their leadership of the company dictates they *have* to be the spokesperson, and that leadership skill, or in many cases of these kinds of videos, product engineering skill – translates to presentation skill. It doesn’t always. That’s why we hire actors and presenters. This is again very common in business videos when nobody has the stones to tell the big cheese they don’t have what it takes. You have to be a pretty secure person to take criticism. You can fight like heck to try and tease a performance out of a non-performer, but in most of these cases, the producer or director just rolls over, lets it happen, and prays that the thing can be saved in post. Somehow. 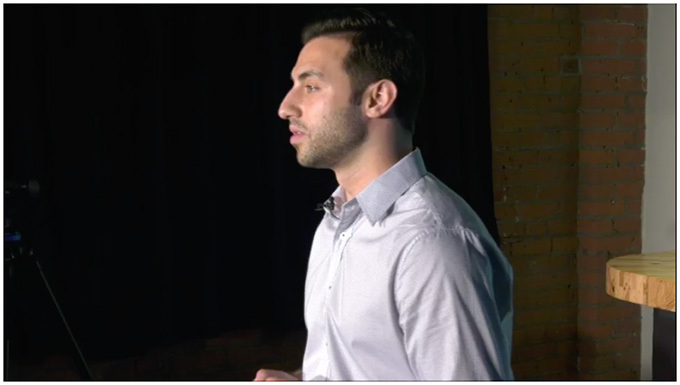 The choice of sets or venues is, again, usually something foisted off on the producer/director in these business video cases. There’s never any money budgeted for the locations, they are an afterthought and decided by what’s expedient. Non-professionals look at a space that may work for still photography, (where the photog is crafty) and often think it’s perfect for video as well. A company’s lack of confidence in the producer means they have no power to try to make things better, only to passively execute what’s been handed them. Then to make the unworkable space work, the director needs a lot of extra lighting tools, which are, again, not in the budget. When I take a production planning meeting, a question I sometimes ask the businesspeople is: “How much profit are you expecting from the sales of this new product, in dollars?” Believe me, they have a figure in mind. Months have been spent to develop the product and understand the market. “Well, at least we didn’t waste a lot of money on the videos”. This is a BRILLIANT write-up. Thanks for taking the time to share it. Well, Larry, nobody deliberately sets out to make a bad presentation video. They happen from a confluence of factors, from uncertainty and lack of focus in the command structure, to a lack of authority and decision-making power given to the creative leads, unrealistic budget assumptions, and, these days, an approach that values the perceived “authenticity” of an “amateur, un-structured approach” that ignores conventions of shot composition and story-telling, eschewing “slick, professional-looking” video. You know; video that works. I’m not talking about the original video in question here but many examples out in the wider world. Making the video look haphazard and roughly done does not actually make it more “youthful”, “hip”, “truthful” or “honest” or compelling. Remember the short fad of off-axis, deliberately mis-framed “shaky-cam”? Today image stabilizers are selling like hotcakes with hundreds of offerings, because it turns out, people like *moving* video but hate *shaky* video. The thing that’s actually communicated most loudly with a “deliberately amateur” approach is a lack of commitment and a stubborn refusal to try for high standards. Which to me, as the audience, is insulting. You might sketch a first rough outline of a building on a cocktail napkin, but that’s not the blueprint you hand to the construction crew. And you don’t make a half-fast presentation hoping the audience will just gloss over the flaws and fill-in the missing details themselves, because you think the content is stand-alone compelling. The cases where that’s true are super rare. Let’s learn from this and share suggestions on better ways to do such a job. I’ll start with this: they mis-used the product engineer and his expertise. The way they achieve that is by spending lots of time rehearsing the topics in live practice conversations, and maybe in phone support calls, where the questions come up in different forms over and over. They can talk about the product in the same way they can talk about their last fishing trip or their kid’s school play. And the product development engineer that built the widget already has that product knowledge baked-in. She or he -should- be a goldmine for presenting the features, …if used right. The worst thing you can do to an expert like that though is, make him follow scripted bullet points off a powerpoint deck, in someone else’s words. It disconnects him or her from their well-integrated base of knowledge, where they are confident, comfortable and relatable. And it disconnects them from making a rapport with the audience (and this was almost certainly a canned audience of company people and their families, not a hostile audience of strangers). I agree with Larry and others that the studio audience was unnecessary and probably a hindrance. A better approach, I think, would have been to create three representative setups, in the studio, for low, medium, and high-end users, and by turns, having each of these users “interview” the expert as he talks them thru the specific hook-up and relevant features for each use case. It’s the difference between a salesman doing a spiel in a 30-second car ad, and that same salesman going on a test-drive with you, answering questions and pointing out features.